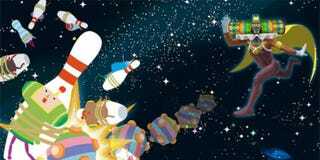 I finally started playing Katamari Damacy last night. It's a lot of fun—more than than I had anticipated or remembered, despite me watching it and playing it a very briefly a few times at a friend's place. It can get a little buggy, and it can certainly get weird, but that's always been part of the game's charm. But I have to admit, ever since I heard that little tidbit about the game being a commentary on capitalism, I've always felt a little guilty for playing it. Honestly, just because of how simple the concept is and how well they pulled it off, I totally forgot it was a last generation title—to the point where I completely forgot that it wouldn't save for me. Long story short, I spent a chunk of this morning trying to get back to where I was. What the hell is Square Enix doing on Twitch?